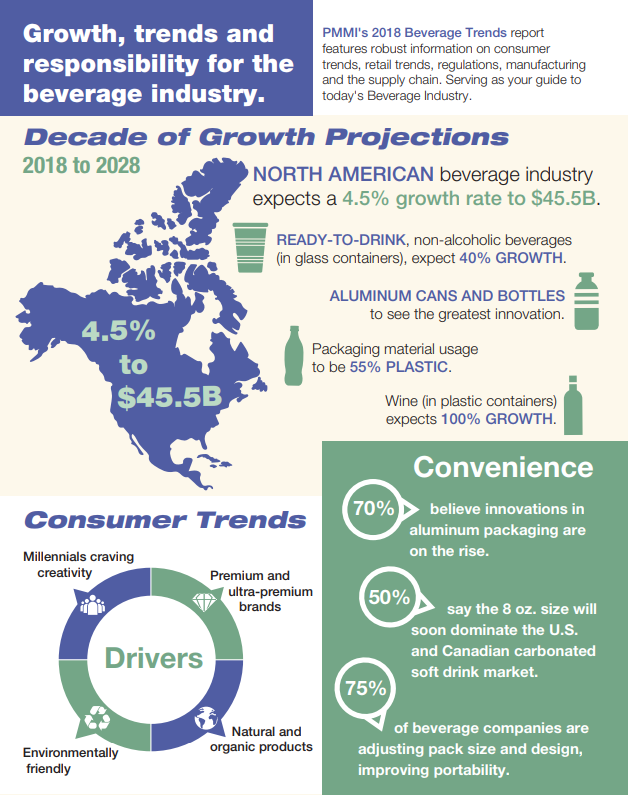 The beverage packaging and processing industry is experiencing major growth according to the 2018 Beverage Trends in Packaging and Processing report and accompanying infographic, produced by PMMI, The Association for Packaging and Processing Technologies. PACK EXPO International and the co-located Healthcare Packaging EXPO (Oct. 14–17, McCormick Place, Chicago) arrives just in time to feature all the solutions beverage manufacturers need to navigate this rapid development. The North American beverage industry is expected to grow 4.5 percent to $45.5 billion in the next ten years. Despite 70 percent of respondents believing aluminum cans and bottles are expected to see the greatest innovation in design, container and graphics enhancements, plastic still accounts for 45 percent of packaging material usage. Ready-to-drink, non-alcoholic beverages (in glass containers) are expected to grow at about 40 percent and wine (in plastic containers) is projected to increase 100 percent by 2028. Environmental responsibility has increased in importance to beverage manufacturers. PET bottles from 100 percent recycled PET resin now offer the same clarity and barrier properties as 100 percent virgin PET. More than 75 percent of beverage companies are actively taking steps to reduce the materials in their package and lessen their overall carbon footprint. Aluminum accounts for 70 percent of recycled beverage containers while glass accounts for 23 percent. This fall’s PACK EXPO International and co-located Healthcare Packaging EXPO, produced by PMMI, offers ample opportunities for beverage manufacturers to explore new package designs, cutting-edge machinery technology and automation solutions to meet consumer demands and help achieve their business goals. Bringing together 2,500 exhibitors and 50,000 attendees over 1.2 million net square feet of exhibit space from virtually every vertical market, PACK EXPO International is indisputably the year’s most comprehensive packaging event on the continent—and the one that powers innovation like no other. With so many solutions on display, attendees are sure to find ways to apply new technology, achieve cost-saving efficiencies or unexpectedly boost output. For more information and to register, visit www.packexpointernational.com.